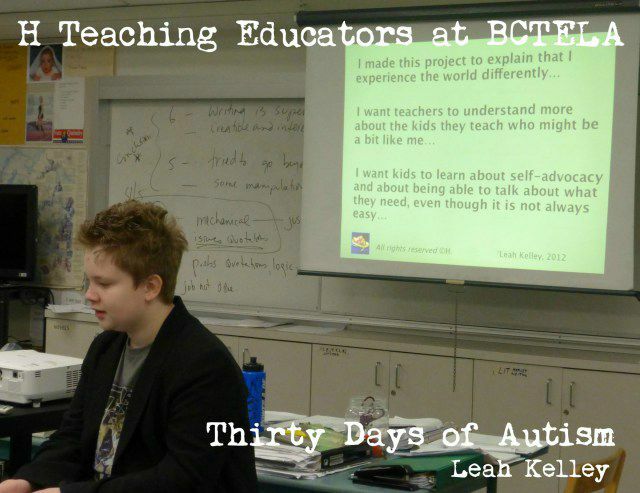 Those of you who follow Thirty Days of Autism likely know that H co presented with me at the BCTELA Provincial Conference (BC Teachers of English Language Arts) this past weekend. You can read more about that here and here. As anticipated, it was a fabulous experience! H did a wonderful job sharing his presentation, and as also anticipated, he was proud to be presenting, but pretty much ready to bolt right after he clicked through his final slide. I understand that response, and support H in responding to his needs. However this is the fifth time that H has presented, and though he would not be comfortable fielding questions, it seemed important that he stick around a little longer to hear some feedback from the teachers. I’ll admit to having pushed him just a little bit here… but I think it was a stretch that will benefit him and support him in developing a greater understanding about the impact of the work he is doing. Having H stay for a few minutes afterward gave the educators an opportunity to respond to him with appreciation for his message and know that the message was received. They shared that they were impacted, which gave H first-hand information about the value of his work. This too supports his advocacy, his sense of self, and his pride in his message. Thank you! 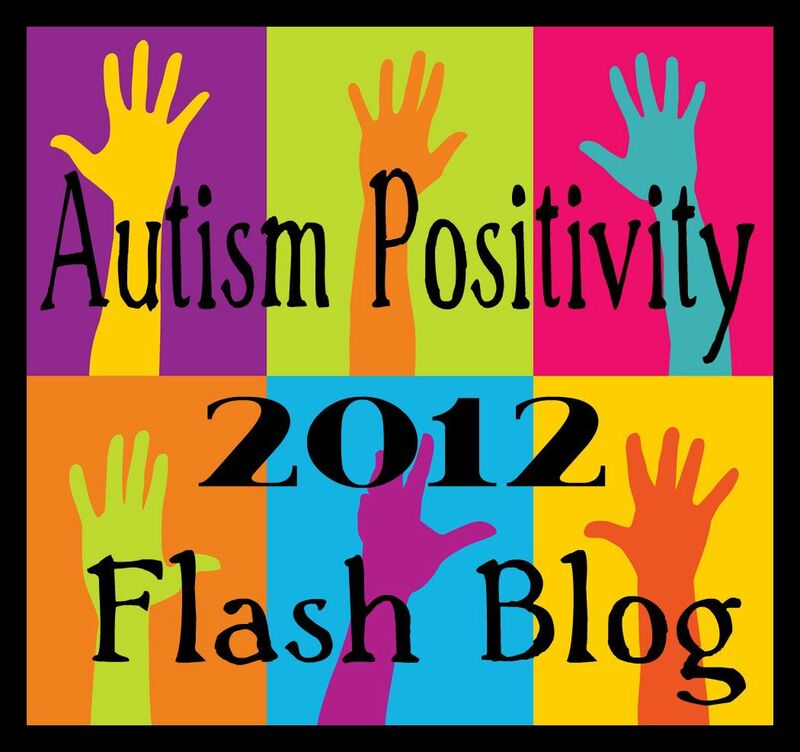 This will help me understand my Autistic (and other) students better. You are brave – I couldn’t talk to a group of teachers like this when I was your age. It is good to understand and talk about what you need. We are listening and you were heard! H presenting to Educators at the BCTELA Conference (final slide of his presentation). The cycle of communication is not fully completed until we understand that the message has been received. This entry was posted in acceptance, advocate, Autism, Autistic People Speaking, BC Teachers Federation, BCTELA 2013, BCTF, Dear Teacher: A letter from H, diversity, Educator, Laura Nagle, listening, Neurodiversity, self-advocacy, Speaking, Special Education, Teacher, Vectors of Autism and tagged advocacy, BC Teachers of English Language Arts, BCTELA Conference, completing the cycle of communication, Dear teacher: A letter from H, feedback, listening, response, Teen teaches teachers about Autism. Bookmark the permalink. Wonderful. Simple and simply wonderful. This is a good developmental road for H to take. Well done both. Colin, you have had a positive influence on me and my interactions with H (and others). I have such faith in your sensitivity and perspective, and thus your comment is both reassuring and encouraging. Appreciation for your words, endless patience, gentle nudges, and gift of support. Thank you! Brave lad H is, please tell him how proud I am that he is advocating for himself and so many others. Hurrah! That’s truly impressive of your son and of you, for encouraging and helping him to learn to advocate early on! Kudos to both of you!